Kick your office into high gear with this steampunk-style receptacle. Kick your office into high gear with this steampunk-style receptacle. 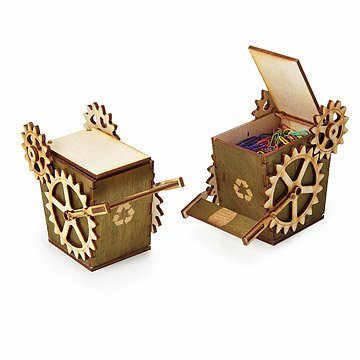 Laser-cut from sheets of hand-stained wood and imprinted with the artist's thumbprint, Lance Nybye Jr.s industrial bin keeps your sticky notes, pens, paperclips, pushpins, and other supplies cleverly contained so you can avoid working in dystopic disarray. With a machine-inspired motif, this bin shows off your enthusiasm for eco-conscious living and makes tidying up a treat. Handcrafted in San Diego, California. The person I gifted this to is a model builder and able to fix the broken lid. Otherwise I would have returned it. I love the box...it just seems to have construction issues. I liked the kinetic nature of these items, and I ordered 6 of them. They are slightly larger than I anticipated, which is a good thing. I intend to fill them with paper clips and rubber bands. Now I just have to hope my cats don't figure out how to open them! Oh, and thanks for the 5 different pairs of earrings that were included in these steampunk storer of items. I really like the look of the steampunk but the box was smaller than what I had envisioned. Cute! You had it packed so well. I wish it had been heavier, but it probably would have been more cumbersome to operate. This is a really unique and unusual item. However, it doesn't really have much of a purpose except as maybe an interesting way to keep paper clips or binder clips on your desk. If you know someone into "steampunk" it makes a great gift. But otherwise, not really a reason to purchase.